The invention discloses a preforming method of network resource, which comprises the following steps: the transmitting network receives the resource preforming request to acquire the logic transmitting network mark information carried by resource preformed request; the transmitting network preformes link resource for logic transmitting network according to the resource preforming request. The invention can divide and manage the resource for physical transmitting network flexibly and rapidly, which improves the resource allocating speed of physical transmitting network greatly. 随着传送网络的链路带宽等物理资源的不断增长，在传送网络上可以根据客户业务的实际需要，在逻辑上将传送网络的物理资源进行细分。  With the continuous growth of the physical link bandwidth resources such as transport networks, according to the actual needs of the customer's business, a breakdown in physical resources logically transport network on the transport network. 还可以通过对传送网络进行分割处理，将一个物理传送网络划分成多个逻辑传送网络。 It can also be transmitted through the network dividing process, the physical transport network into a plurality of logical transmission network. 每个逻辑传送网络的拓扑可以和物理传送网络的拓扑相同也可以和物理传送网络的拓扑不同，这种附加在一个物理传送网络上的多个逻辑传送网络可以分别适应不同类型业务的需求。 Each logical network topology may be transmitted and the physical topology of the transport network may be the same as the physical topology of the transport network and different, such additional plurality of logical networks over a physical transmission network may be adapted to transport different types of services are needs. 例如，通过对物理传送网络的资源进行分割处理，将整个物理传送网络划分成三种不同的逻辑传送网络，其中一个逻辑传送网络用来承载IP业务，一个逻辑传送网络用来承载ATM (异步传输模式）业务，另一个逻辑传送网络用来承载SDH(同步数字系列）/SONET(同步光纤网）业务。 For example, by the physical transport network resource division processing, the entire physical transmission network is divided into three different logical transport network, wherein transport network to a logical carry IP services, a transfer network for carrying logical ATM (Asynchronous Transfer mode) service, another logical transmission network for carrying SDH (synchronous digital Hierarchy) / SONET (synchronous optical network) service. 拓扑）技术就是在考虑如何对传送网络内部的物理资源进行有效的管理。 Topology) technology is considering how the physical transfer of the internal network resources for effective management. 另外，IETF LI VPN (1层虚拟专用网络）工作组也在考虑通过L1VPN技术对传送网络的资源进行有效的管理，以实现L1VPN网络的需求。 In addition, IETF LI VPN (1 Layer Virtual Private Network) working group is also considering the effective management of resources by L1VPN transport network technology to achieve demand L1VPN network. 在上述通过各种技术（如，VNT、L1VPN)对传送网络的资源进行划分和管理的过程中，如何快速有效地进行网络资源预留是其中的关键技术。  In the process of dividing and managed by various techniques (e.g., VNT, L1VPN) resources of the transport network, how to quickly and efficiently perform network resource reservation is one of the key technologies. 现有技术中一种对传送网络的资源进行划分和管理的方法为：集中式资源管理方法。 Method  The prior art kind of transport network resources and management are divided: the centralized resource management method. 该方法主要通过集中式的方式来实现，管理员手工对传送网络的资源进行划分和管理。 The method primarily through a centralized way for administrators to manually transport network resources are divided and management. 划分完成后的各个链路资源都具有特定的VPN(虚拟专用网络）标识，根据该VPN 标识在控制平面确定某个资源所能使用的VPN链路资源。 Each link resource partitioning the completion has a specific VPN (Virtual Private Network) identifier, a resource determined VPN link resource that can be used in the control plane according to the VPN identifier. 1、管理员通过规划确定VPN成员之间具有TE(链路工程）属性的拓扑关系图。  1, the administrator has the topology diagram TE (link works) properties between VPN members through the planning OK.
 2、管理员根据上述拓扑关系图，确定网络内部拓扑所经过的节点，并确定节点与节点之间需要预留的链路带宽资源信息。  2, the administrator based on the topological diagram, the nodes within the network topology to determine elapsed, and determining the required link bandwidth resource reservation information between the node and the node. 3、管理员根据所确定的需要预留的链路带宽资源信息，确定网络内部和预留的链路资源相关的节点的入端口和出端口需要预留的带宽信息。  3, according to the administrator link bandwidth to be reserved resource information determined, determining the internal node and link resources reserved for the associated port and the network port to be reserved bandwidth information. 4、管理员根据所确定的相关节点的入端口和出端口的信息，通过VPNManager 逐一配置对应节点（包括PE节点和P节点）相关端口资源的预留信息。  4. The information administrator inlet port and an egress port associated with the determined node, the reservation information related to resources through ports disposed individually VPNManager correspondent node (including PE node and a node P). 5、配置完成后，为VPN预留的端口和链路资源信息通过资源自动发现或本地手动配置处理传递到控制平面，在控制平面形成VPN预留资源池。  5. After the configuration, and the VPN link resources reserved ports or local information to manually configure the automatic discovery process through to the control plane resources in the control plane resource pool reserved for VPN formation. 当VPN连接请求到达时，控制平面从该VPN的预留资源池中为VPN连接请求和分配可用资源。 When the VPN connection request arrives, the control plane resource pool reserved for the VPN connection to the VPN request and allocation of available resources. 4、当传送网络发生故障时，需要人工重新为受影响的VPN等逻辑传送网络拓扑分配新的链路资源，不利于逻辑传送网络拓扑的快速更新和恢复。  4, when the transmission network fails, the need to manually re-link allocation of new resources for the affected VPN and other transport network logical topology, is not conducive to rapid update logic transport network topology and recovery. 鉴于上述现有技术所存在的问题，本发明的目的是提供一种对网络资源进行预留的方法，从而可以快速灵活地对物理传送网络的资源进行划分和管理，大大提高物理传送网络的资源配置速度。  In view of the above-described problems of the prior art, an object of the present invention is to provide a method for reserving network resources, can be fast and flexible so that the physical resources and transport network management divide, greatly improved physical transfer speed of the network resource allocation. 所述其它节点给所述逻辑传送网络完成本节点相应的入端口和出端口链路的带宽资源预留，并标识预留资源的归属；在所述源节点和目的节点之间建立虚拟的标签交换路径V-LSP。  The other network node to the logical completion of the corresponding transfer ports and output ports of the link bandwidth resource reservation according to the present node, and identifies the home resource reservation; established between the source node and the destination node virtual label switched path V-LSP. 所述的资源预留请求中携带：预留的链路带宽资源的共享属性信息和/或部分或全部显示路由信息和/或需要预留的链路资源的标识信息。  The resource reservation request carries: a shared link bandwidth resources reserved attribute information and / or show all or part of the routing information and / or identification information of link resources to be reserved. 所述逻辑传送网络为虚拟专用网络VPN或1层虚拟专用网络LlVPN或虚拟网络拓扑VNT网络。  The transmitting logic network or virtual private network (VPN) 1 layer virtual private network or virtual network topology LlVPN VNT network. 根据所述资源预留请求中携带的链路带宽资源的共享属性信息，将所述V-LSP 所预留的链路资源在所述逻辑传送网络内部不同V-LSP之间进行共享。  The attribute information of the shared link bandwidth resource of the resource reservation request carried in to the V-LSP link resources reserved shared between different logical network transmission inside the V-LSP . 所述端节点确定V-LSP所经过的网络节点和预留的链路资源信息后，向网络中的路径计算服务器发布相关的信息，所述路径计算服务器根据该发布的信息来更新所述逻辑传送网络的TE数据库。 After  the end node determining V-LSP through which the network node and link resource reservation information, the path calculation server in the network publish information, the path calculation server to update the information according to the publication the logical database TE transfer network. 所述V-LSP的端节点通过信令机制中的记录路由功能或者资源预留请求中指定的显示路由信息来确定所述V-LSP所经过的网络节点和预留的链路资源信息。  V-LSP said end node to determine the V-LSP passes reservation network node and link resources reserved Display routing information request signaling mechanism specified by the routing function of recording resources or information. 所述逻辑传送网络的自动发现机制包括：基于边界网关协议BGP或基于内部网关协议IGP的发现机制。  The logical transport network automatic discovery mechanism comprising: a Border Gateway Protocol BGP-based mechanism or discovery based Interior Gateway Protocol IGP. 所述V-LSP所经过的网络节点通过路由扩散机制将本节点预留链路资源的信息在网络中进行发布。 Information  The V-LSP passes through the network node routing node diffusion mechanism link resources reserved in the network publishing. 网络中的所有节点和/或网络中的路径计算服务器根据所述网络节点发布的本节点预留链路资源的信息来更新本地包含的全网TE数据库。  All the nodes in the network and / or network path calculation server link resource reservation information according to the node of the network node to update the entire network publishing TE local database included. 网络中的路径计算服务器根据网络节点发布的本节点预留链路资源的信息来更新所述逻辑传送网络的TE数据库和更新本地包含的全网TE数据库。  The path calculation server network link resource reservation information according to the nodes of the network node updating the released logical transfer network and update the entire network database TE TE local database included. 网络中的路径计算服务器根据所述网络节点发布的本节点预留链路资源的信息来更新所述逻辑传送网络的TE数据库和更新本地包含的全网TE数据库。  The path calculation server network link resource reservation information according to the release node of the network node to update the TE database update logic transport network and the local network-wide database contains TE. 当所述逻辑传送网络收到客户业务请求后，从所述给该逻辑传送网络预留的链路资源中给所述客户业务分配标签资源，建立端到端的交叉连接，给所述客户业务提供连接服务。  When the client receives the logical network transmits a service request from the link to the logical resource reserved in the transport network to the customer service label resources allocated, to establish a cross-connection end, to the customer service providing connectivity services. 当所述传送网络发生故障时，检测到故障的节点确定受故障影响的链路资源和受故障影响的逻辑传送网络对应的V-LSP，通过控制平面发起所述V-LSP的保护或恢复信令过程，重新为所述受故障影响的逻辑传送网络预留可用的链路资源。  When the transport network failure, a node failure is detected to determine link resource affected by the failure of a logical and transport network affected by the failure of the corresponding V-LSP, protection by initiating a control plane of the V-LSP or restoration signaling process, re-reserve link resources available to the logical transport network affected by the fault. 1、实现快速灵活地对物理传送网络的资源进行划分和管理，大大提高了VPN 等逻辑传送网络的资源配置速度。  1, fast flexible physical resources and transport network is divided into management, greatly improving the speed of VPN resources of the transport network and other logic. 2、能够根据物理传送网络的故障情况，动态调整VPN等逻辑传送网络的拓扑，以保证客户网拓扑的正常运行，提高逻辑传送网络的可用性。  2, can be transmitted according to the physical fault network, VPN, dynamic adjustment logical topology transfer network, to ensure the normal operation of the customer network topology, increase the availability of the logical transport network. 3、实现了物理传送网络的资源的高效利用。  3, to achieve efficient use of resources of the physical transport network. 图7为本发明所述实施例中受故障影响的V-LSP路径上的节点会发起重路由处理并建立新的预留路径V-LSP的示意图。  The embodiment of FIG. 7 on node V-LSP paths affected by the failure of the embodiment will initiate rerouting processing path and a new reservation schematic V-LSP establishing the present invention. 本发明提供了一种对网络资源进行预留的方法，本发明的核心为：传送网络根据收到的资源预留请求后，通过信令过程自动地为相应的逻辑传送网络预留链路资源。  The present invention provides a method of network resource reservation method of the present invention, the core is: after transmitting the reservation request the network to reserve corresponding logical transport network through a signaling process according to the resource is automatically received link resources. 步骤2-1、将物理传送网络划分为一个或多个逻辑传送网络。  Step 2-1, the physical transport network is divided into one or more logical transfer network. 为实现对物理传送网络的资源进行灵活管理，使传送网络能够适应不同客户的不同需求，本发明首先需要将实际的物理传送网络划分为一个或多个逻辑传送网络。  In order to realize the physical resources of the transport network for flexible management of the transfer network to meet the different needs of different customers, the present invention first requires the actual physical transport network is divided into one or more logical transfer network. 物理传送网络的资源管理器根据客户业务的实际需要，在该物理网络的一组特定的网络边缘节点之间确定一条或多条具有一定TE属性的链路资源，这组特定的网络边缘节点便构成了一个逻辑传送网络的成员节点，如，VPN网络中的PE节点。  The physical transport network resource manager according to the actual needs of the customer service, determining one or more attributes TE link resource has a certain strip between a specific set of network edge node of the physical network, that particular set of network edge node members constitute a logical node in a transport network, such as, VPN PE nodes in the network. 资源管理器为这个特定逻辑传送网络分配一个全局唯一的ID标识，如，VPN ID。 The resource manager allocates a globally unique ID, such as, the VPN ID for this particular logical transport network. 资源管理器重复进行上述过程，便可以将实际的物理传送网络划分为多个逻辑传送网络。 Explorer repeating the above procedure, it is the actual physical transport network may be divided into a plurality of logical transmission network. 所述资源管理器可以驻留在传送网络的网络管理系统NMS中、或者驻留在VNT管理器中、或者驻留在VPN管理器中、或者驻留网络中某个确定的节点之中，或者驻留在单独的资源管理服务器中。 The resource manager may reside in the network management system NMS transport network, or reside in the VNT manager, or the manager resides in a VPN, or resident in a node in the network is determined, or reside in a separate resource management server. 步骤2-2、传送网络收到资源预留请求后，通过信令过程自动为相应的逻辑传送网络预留链路资源，建立V-LSP (虚拟的标签交换路径）。  Step 2-2, the transport network resource reservation request is received, the automatic link resources reserved for the transmission network via a respective logical signaling procedure, establishing V-LSP (label switched virtual path). [0081 ] 6、为V-LSP所预留资源的在相同VPN的不同V_LSP之间的共享属性信息， 如，1为专用预留、n(n> 1)为最大允许被本VPN内部的η条V-LSP共享。  6, V-LSP as the reserved resource sharing attribute information between different V_LSP the same VPN, e.g., a dedicated reservation, n (n> 1) is the maximum allowed to be present inside the VPN η Article V-LSP shared. 在上述信息中，1〜4项内容为必须包含的信息，5〜7项内容为可以包含也可以不包含的信息。  In the above information, the information items 1 ~ 4 must contain, 5 ~ 7 items of information may contain or may not contain. 当物理传送网络的源边缘节点收到上述资源预留请求后，通过指定的显示路由信息或通过路由请求来确定到达目的边缘节点的部分或全部显示路由信息。  When the source edge node of the physical transport network receiving the resource reservation request, or the specified display route information determined by the route request through to the destination edge node portion or all of the route information display. 然后，源边缘节点通过信令过程将接收到的资源预留请求沿着一个或多个中间节点一直传递到目的边缘节点。 Then, the source edge node to the received resource reservation request through a signaling process has been passed along one or more intermediate nodes to the destination edge node. 源边缘节点、中间节点和目的边缘节点还根据接收到的上述资源预留请求，完成对本节点相应的入端口和出端口链路的带宽资源预留，并标识该预留资源的归属以及预留资源的共享属性信息。  The source edge node, intermediate nodes, and destination edge node is further based on the received resource reservation request to complete the corresponding ingress port and the bandwidth reservation of the link ports of the node, and identifies the home resources reserved and attribute information sharing reserve resources. 上述资源预留只涉及对节点相应的入端口和出端口的链路资源进行预留，不涉及节点标签资源的分配和节点交叉连接的处理。 It said resource reservation relates only to the respective nodes and an inlet port link resources reserved port is not allocated to processing node and resource node label cross-connection. 在源边缘节点、所有中间节点和目的边缘节点都完成了上述资源预留的处理后，在源边缘节点和目的边缘节点之间就建立了一条V-LSP。 After  the source edge node, intermediate nodes and destination edge node above processing is finished resource reservation, the edge between the source node and the destination edge node on the establishment of a V-LSP. 然后，V-LSP路径上的节点将该V-LSP所经过的网络节点和预留的链路资源信息返回给资源管理器或相关的路径计算服务器。  Then, the V-LSP node on the V-LSP path through the network node and link resource reservation information back to the resource manager server or the associated path computation. 上述对物理传送网络的链路资源预留请求是由传送网络的资源管理器发起的，在实际应用中，该链路资源预留请求也可以由客户设备发起，请求发起和资源预留的过程与上述资源管理器发起的过程类似。  The physical transfer of network link resource reservation request is initiated by the transmission network resource manager, in practical applications, the uplink resource reservation request may be initiated by a client device, a request to initiate and Resource Reservation stay with the above process explorer launched the process is similar. 步骤2-3、将网络节点预留的链路资源信息在网络中进行发布，形成整个逻辑传送网络的网络拓扑。  Step 2-3, the network node to reserve link resources of publishing information in the network, the network topology of the entire logical form transfer network. 当针对一个逻辑传送网络完成了一条或多条链路资源预留，建立了一条或多条V-LSP后。  Upon completion of the one or more links for a logical resource reservation transport network, after the establishment of one or more V-LSP. 建立的V-LSP所经过的网络节点通过路由扩散机制将本节点所预留链路资源的信息在网络中进行发布。 V-LSP information established network node through which the routing mechanism diffusion node link resources reserved in the network publishing. 如，向全网中其它节点发布或向网络中的路径计算服务器发布。 E.g., computing servers, or released to release the network path to the other nodes in the whole network. 1、V-LSP所经过的网络节点向网络中发布的信息包括链路标识、剩余带宽值、 被预留的带宽值、归属的逻辑传送网络的ID或VPN ID标识信息等。  1, V-LSP through the network node comprises a link identification, the remaining bandwidth value, the reserved bandwidth value to the information published in the network, ID, or identification information of a home VPN ID logical transport network, and the like. 如果将上述预留链路资源的信息向网络中的其它节点发布，网络中的所有节点根据上述发布的链路标识、剩余的带宽值来更新本地包含的全网TE数据库。  When the reservation information of the release link resources to other nodes in the network, all the nodes in the network is updated based on the release of the link identification, the remaining bandwidth of the full-TE network database locally contained. 网络中该逻辑传送网络的成员节点（如，VPN中的PE成员节点）根据上述发布的所有信息来更新该逻辑传送网络的TE数据库。 Members of the logical nodes in the network transfer network (e.g., PE in the VPN membership node) to update the logical transfer network database based on all the information of the TE released. 如果将上述预留链路资源的信息向网络中的路径计算服务器发布，则路径计算服务器根据上述发布的所有信息来更新该逻辑传送网络的TE数据库以及全网TE数据库。  When the reservation information of the link to the publisher server computing resources in the network path, the path calculation server updates the logical transfer network based on all information of the database as well as the whole release TE TE network database. 如果上述发布的链路资源信息只包括链路标识、剩余的带宽值，则网络中的所有节点和/或网络中的路径计算服务器根据所述发布的信息来更新本地包含的全网TE数据库。  If the above-described link resources, information includes only link identification, the remaining bandwidth value, then all nodes in the network and / or network path calculation server to update the entire network based on the information contained in the local release of TE database. 2、V-LSP所经过的网络节点向网络中发布的信息包括链路标识、剩余带宽值； 如果将上述预留链路资源的信息向网络中的其它节点或路径计算服务器发布，网络中的节点或路径计算服务器根据链路标识、剩余的带宽值来更新本地包含的全网TE数据库； 当V-LSP建立完成后，V-LSP的端节点（即V-LSP的源节点和/或目的节点）可以通过信令机制的路由记录功能或根据资源预留请求信息中所指定的全部显示路由信息来确定该V-LSP所经过的网络节点和预留的链路资源信息。  2, V-LSP information of the network node via the network issued to include link identification, the remaining bandwidth value; if the link information of the reserved resources to other computing nodes or paths in the network server release, nodes in the network path calculation server or the entire network to update the local database included in the TE link identifier according to the remaining bandwidth value; when the V-LSP is established, V-LSP end node (i.e. a source node and a V-LSP / or destination node) may be displayed or all of the routing information specified in the resource reservation request according to the determined V-LSP through the network node and link resource information reserved recording function by routing signaling mechanism. 所述端节点确定V-LSP所经过的网络节点和预留的链路资源信息后，通过逻辑传送网络成员节点之间的自动发现机制， 在逻辑传送网络的成员节点之间交互V-LSP所经过的网络节点和预留的链路资源信息， 端节点根据交互的信息来更新该逻辑传送网络的TE数据库。 After the end node determines that the network node and link resource information reserved V-LSP passes through auto-discovery mechanism between the logical transmitting network node members, among members of the network node logic transmits the interaction V-LSP after network node and link resource information, reserved end node updates the logical transfer network database based on information exchange TE. 和/或，所述端节点确定V-LSP所经过的网络节点和预留的链路资源信息后，直接向路径计算服务器发布所述信息，路径计算服务器根据所述发布的信息来更新该逻辑传送网络的TE数据库。 V-LSP passes the network node and link resource reservation information, and / or determining the end node, calculating the direct path to the server publishing information, the path calculation server logic updates the information according to the published TE database transmission network. 1、V-LSP所经过的网络节点向网络中发布的信息包括链路标识、剩余带宽值、 被预留的带宽值、归属的逻辑传送网络ID或VPN ID标识信息、预留资源的共享属性等。  1, V-LSP through the network node comprises a link identification, the remaining bandwidth value, the reserved bandwidth value to the information published in the network, a home network ID or a logical transmitting identification information of the VPN ID, reserved resources shared attributes. 如果将上述预留链路资源的信息向网络中的其它节点发布，网络中的所有节点根据所述发布的链路标识、剩余的带宽值、被预留的带宽值、预留资源的共享属性值来更新本地包含的全网TE数据库。 If the link information of the reserved resource release to other nodes in the network, all the nodes in the network based on the link identifier released, the remaining bandwidth value, the reserved bandwidth value reserved resources shared properties TE value to update the entire network database locally contained. 归属的逻辑传送网络ID所对应的逻辑传送网络的成员节点根据上述发布的信息来更新该逻辑传送网络的TE数据库。 Logical transport member node home network ID corresponding to the logical transfer network to update the logical transfer network according to the information of the TE database published. 如果将上述预留链路资源的信息向网络中的路径计算服务器发布，则路径计算服务器根据上述发布的所有信息来更新归属的逻辑传送网络ID所对应的逻辑传送网络的TE数据库以及全网TE数据库。  When the reservation information of the link to the publisher server computing resources in the network path, the path calculation database server logic TE transfer network to update the home logical network ID corresponding to the transmission based on all information of the release and TE entire network database. 如果上述发布的链路资源信息只包括：链路标识、剩余的带宽值、被预留的带宽值、预留资源的共享属性。  If the resource information of the link comprises only released: identifying a link, the remaining bandwidth value, the reserved bandwidth value reserved resources shared properties. 则网络中的所有节点和/或路径计算服务器根据所述发布的信息来更新本地包含的全网TE数据库。 All nodes in the network and / or the path calculation server to update the entire network TE local database based on the information contained in the publication. 2、V-LSP所经过的网络节点向网络中发布的信息包括链路标识、剩余带宽值、 被预留的带宽值、预留资源的共享属性；如果将上述预留链路资源的信息向网络中的其它节点或路径计算服务器发布，网络中的所有节点或路径计算服务器根据链路标识、剩余的带宽值来更新本地包含的全网TE数据库；当V-LSP建立完成后，V-LSP的端节点可以通过信令机制的路由记录功能或根据资源预留请求信息中所指定的全部显示路由信息来确定该V-LSP所经过的网络节点和预留的链路资源信息。  2, V-LSP information of the network node via the network issued to include link identification, the remaining bandwidth value, the bandwidth value reserved, reserving the shared resource attributes; if the above resource reservation link calculating information to other nodes or servers in the network path release, all nodes or paths in the network computing server to update the local database contains the entire network TE link identifier according to the remaining bandwidth value; when the V-LSP is established, V-LSP end node may be displayed or all of the routing information specified in the resource reservation request according to the determined V-LSP through the network node and link resource information reserved recording function by routing signaling mechanism. 所述端节点确定V-LSP所经过的网络节点和预留的链路资源信息后，通过逻辑传送网络成员节点之间的自动发现机制，在逻辑传送网络的成员节点之间交互V-LSP所经过的网络节点和预留的链路资源信息，端节点根据交互的信息来更新该逻辑传送网络的TE数据库。 After the end node determines that the network node and link resource information reserved V-LSP passes through auto-discovery mechanism between the logical transmitting network node members, among members of the network node logic transmits the interaction V-LSP after network node and link resource information, reserved end node updates the logical transfer network database based on information exchange TE. 和/或，所述端节点确定V-LSP所经过的网络节点和预留的链路资源信息后，直接向路径计算服务器发布这些信息，路径计算服务器根据上述发布的信息来更新该逻辑传送网络的TE数据库。 V-LSP passes the network node and link resource reservation information, and / or determining the end node, calculating the direct path to the server publishing information, the path calculation server logic updates the information of the transmission network in accordance with published the TE database. 所述的自动发现机制包括：基于BGP(边界网关协议）或基于IGP(内部网关协议）的自动发现机制。  The automatic discovery mechanism comprising: BGP (Border Gateway Protocol), or based on the IGP (Interior Gateway Protocol) automatic discovery mechanism. 根据上述网络对所预留的链路资源的发布和处理方法，当一个逻辑传送网络中的所有V-LSP建立完成，并对预留的链路资源信息在网络中发布和处理完成后，该逻辑传送网络的成员节点和/或路径计算服务器中就形成了整个逻辑传送网络的网络TE拓扑。  According to the above-described processing method and release network resources reserved for the link, as a logical all V-LSP setup complete transmission network, and link resources reserved in the information distribution network and the processing is completed after transfer of the logical network member node and / or the paths from the server to form a logical network topology of the entire TE transfer network computing. 步骤2-4、根据接收到的业务连接请求，从预留的链路资源中选择合适的资源为所请求的连接业务分配标签资源，以实现为客户提供连接服务的功能。  Step 2-4, according to the received service connection request, to select the appropriate resources from resource reservation for link connection service label assigned requested resources to implement the functions and services for customers connected. 在形成了整个逻辑传送网络的网络拓扑后，当收到该逻辑传送网络的客户的业务连接请求时，便从上述为该逻辑传送网预留的资源中选择合适的资源为所请求的连接业务分配标签资源，并建立交叉连接，建立标签交换路径，以实现该逻辑传送网络为客户提供连接服务的功能。  After forming the logical topology of the entire network transmission network, when receiving the logical transport network customer service connection request, that the above logic begins transmission network reserved resources to select the appropriate resources for the requested the connection service label allocation of resources and establish cross connections, establishing a label switched path to implement the logic function to provide customers with the transport network connection service. 当上述物理传送网络发生节点或链路故障时，检测到故障的节点分析该故障影响到哪些V-LSP，并确定这些V-LSP所预留的资源以及其所归属的逻辑传送网络。  When the occurrence of the above-described physical transport network node or link failure, node failure analysis detected the fault which affects the V-LSP, and determining the V-LSP reserved resources and transport network it belongs logic . 然后，通过控制平面分别发起对这些V-LSP进行保护或恢复的信令过程，重新为这些受故障影响的逻辑传送网络分别预留新的可用的物理网络资源，并重新形成整个逻辑传送网络的新的网络拓扑。 Then, by the control plane, respectively, initiate the V-LSP protection or restoration signaling procedure, respectively re new reserved network resources available to the logical physical transport network affected by the failure, and re-form the entire logic of the transmission network the new network topology. 从而使逻辑传送网络的网络拓扑可以避开物理网络的故障点实现实时更新。 Logical network topology so that the transfer network fault point can avoid physical network real-time updates. 本发明还提供了本发明所述方法的一个具体实施例，该实施例中物理传送网络的拓扑示意图如图3所示。  The present invention further provides a method according to the present invention a particular embodiment, the physical embodiment of the embodiment the transport network topology diagram shown in FIG. 10 如图3所示，物理传送网络由网络边缘节点PE20、PE21、PE22、PE23,网络内部节点P30、P31以及网络节点之间的物理链路构成。 10  3, the physical link between the physical transport network by a network edge nodes PE20, PE21, PE22, PE23, the internal network nodes P30, P31 and a network node configured. 传送网络资源管理器和网络边缘节点通过DCN(数据通信网）直接相连。 Transport network resource manager, and network edge node is directly connected via the DCN (Data Communication Network). 客户设备CE10、CElU CE12、CE13构成一组客户，客户设备CE50、CE51、CE52构成另外一组客户。 Client device CE10, CElU CE12, CE13 constitute a group of customers, customer equipment CE50, CE51, CE52 constitute another group of customers. 为支持上述两组客户的不同需求，将图3所示的物理传送网络通过资源划分划分出两个逻辑传送网络VPN A、VPNB。  The above-described two different support needs of the customer, the physical transport network shown in FIG. 3 divided into two logical transport network VPN A through resource partitioning, VPNB. 其中VPNA用来支持CE10、CElU CE12、 CE13客户之间的传送服务，VPNB用来支持CE50、CE51、CE52之间的传送服务。 Which VPNA used to support CE10, delivery service between CElU CE12, CE13 customers, VPNB to support transport service between the CE50, CE51, CE52. 物理传送网络剩余的传送资源可以为其它客户提供公共的传送服务。 The remaining physical transmission network transfer resources to provide public transport services to other customers. 路径的链路资源预留请求。 Link resource reservation request path. 比如，该链路资源预留请求中携带的预留请求参数可以具体为：资源预留路径的目的网络边缘节点为PE23，预留带宽值为622M，V-LSP上的链路资源共享属性为VPN内部所有的预留路径共享以及能够被其它不同的VPN的预留路径所共享。  For example, the link resource reservation request carries reservation request parameters may be: destination network edge node resource reservation path is PE23, 622M reserved bandwidth value, the uplink resources on the V-LSP shared property shared by all of the VPN internal reservation path can be shared and reserved paths of other different VPN. 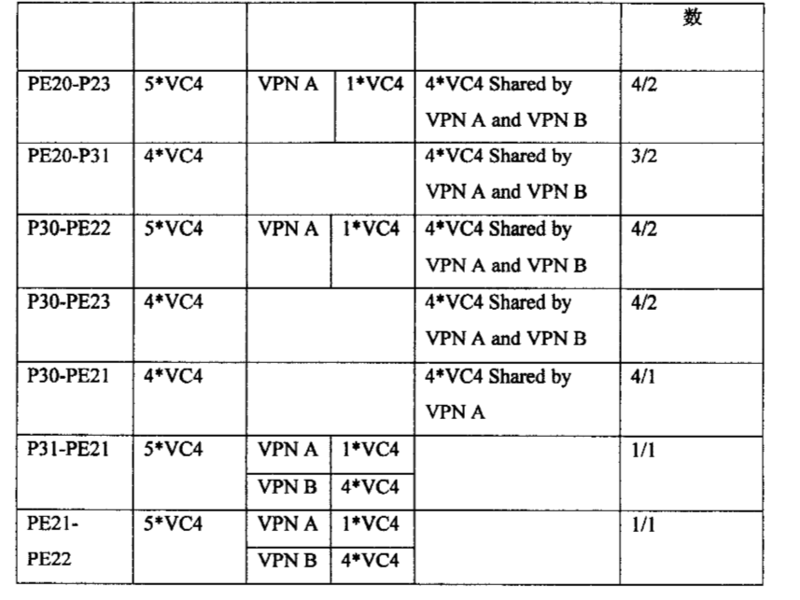 其中，所预留的资源能够最多被4个不同的VPN共享。 Wherein the reserved resources can be shared by up to four different VPN. 2、PE20根据上述预留请求参数，向路径计算模块或路径计算服务器请求路径计算，经过路径计算确定可以满足上述预留请求参数要求的经过P30到达PE23的路径。  2, PE20 request parameter based on the reservation, to a path computation module calculates a path or a path computation request to the server, after determining the path computation meet these requirements through the reservation request parameter P30 of the route to PE23. PE20根据上述预留请求参数的要求，预留本地和P30之间的622M带宽的链路资源，设置该链路资源已经被VPNA预留并能够被VPNA内部其它的所有路径预留请求所共享，而且能被不同VPN共享的最大次数为4。  PE20 request reservation request parameters described above, 622M bandwidth reservation link resources between local and P30, which is provided VPNA link resources have been reserved and the reservation request can be all the other paths inside VPNA shared, and can be shared by different VPN maximum number is four. 然后，向P30转发接收到的链路资源预留请求。 Then, the received forward link resource reservation request to P30. 3、P30收到PE20转发的链路资源预留请求后，根据上述预留请求参数的要求， 预留本地和PE20之间相同的物理链路资源上的622M带宽，并预留本地和下游节点PE23 之间的622M带宽的链路资源并向PE23转发接收到的链路资源预留请求，同时设置对应的入口和出口链路资源已经被VPN A预留并能够被VPN A内部其它的所有路径预留请求所共享，而且能被不同VPN共享的最大次数为4。 After  3, P30 PE20 received forward link resource reservation request according to the requirements of the above-described reservation request parameter, 622M reserve bandwidth on the same physical link resources between local and PE20, and to reserve the local 622M bandwidth resources, and link between nodes PE23 and PE23 downstream forward link resource reservation request is received, and set the corresponding inlet and outlet VPN link resources have been reserved within the VPN a and a can be other the maximum number of paths all shared a reservation request, but can be shared by four different VPN. 同样，PE23收到P30发送的资源预留请求后，也预留相应端口的带宽值并设置预留资源的共享属性值。 After  Similarly, PE23 receives the resource reservation request sent by P30, it is also reserved bandwidth value corresponding port and set property values ​​shared reserved resources. 在PE20、P30和PE23完成上述资源预留操作后，从PE23向源节点PE20反馈预留结果。  After PE20, P30 and PE23 resource reservation completion of the operation, feedback from the PE23 reservation result to the source node PE20. 至此，PE20和PE23之间的一条V-LSP建立完成，该V-LSP我们称为V-LSP1。 At this point, a V-LSP between PE20 and PE23 is established, the V-LSP we called V-LSP1. 4、当网络边缘节点PE20收到为VPN A在传送网络内部预留另外一条V-LSP 资源预留路径的资源预留请求后，该路径的目的网络边缘节点为PE22，预留带宽值为155M，虚拟LSP上的链路资源共享属性为VPN内部专用，并且不能够被其它不同的VPN 的预留路径所共享。  4, when the network edge node is a VPN A PE20 received resource reservation request to reserve an additional V-LSP path reserve resources within the transport network, the destination network edge node of the path is PE22, reserved bandwidth 155M value, link resource sharing on a virtual property of LSP for the VPN-dedicated, and can not be shared by other different reserved path to the VPN. 于是，重复上述步骤2〜3，为VPNA在传送网络内部预留另一条V-LSP2的专用链路资源。  Then, repeat the steps 2 or 3, for the dedicated link resources reserved VPNA another V-LSP2 inside the transport network. 重复进行类似上述步骤2〜3的处理，完成VPN A和VPN B的所有路径预留后，并在VPNA和VPNB中建立相应的V-LSP，VPN A和VPN B中的V-LSP拓扑示意图分别如图4和图5所示。 After  the above-described step is repeated 2 to 3 similar process to complete all paths VPN A VPN B and reserved, and the corresponding V-LSP established in the VPNA and VPNB, V-LSP VPN A and VPN B is topological schematic shown in FIG. 4, respectively 5 and FIG. 当完成上述步骤1〜4的处理之后，传送网络中V-LSP路径上的节点会记录如表1所示的和该V-LSP相关的链路资源预留信息。  After the processing of the above steps 1 ~ 4, the transport network node on the path V-LSP link resource records as shown in Table V-LSP, and the associated reservation information shown in FIG. 1. 当网络中的物理链路为一个VPN预留了部分带宽资源后，该链路被预留的信息需要通过路由机制在网络中发布或向路径计算服务器发布以更新相关的链路状态数据库。  When the physical links in the network resources reserved portion of bandwidth VPN, the information of the link is reserved publication or published to the route calculation server to update the link state routing mechanism through the relevant network database. 扩散的链路信息中包括：该链路剩余的公共带宽资源、该链路为VPNx所预留的带宽资源以及共享属性、该链路的部分带宽最大允许的共享次数以及已经被共享预留的次数。 Diffusion link information includes: the remaining common link bandwidth resource of the link is VPNx reserved bandwidth resources and sharing properties, the maximum fractional bandwidth of the shared link has been allowed and the number of shared reserved frequency. 接收到链路状态更新报文的网络节点或路径计算服务器根据报文中的链路信息更新对应的TE链路状态数据库。 Receiving the link state update packet network node or a path computation server according to the information of TE link state update packets corresponding database. 完成上述资源预留和链路状态更新后，网络节点或路径计算服务器中会形成网络为VPN所预留的链路资源的拓扑信息。  After the above link state updates and resource reservation, network nodes or the path calculation server network topology information will form the VPN link resources reserved. 另外，在通过信令过程进行资源预留的过程中，信令过程可以记录所述V-LSP 经过的网络节点以及对这些节点之间的链路资源预留的结果，并在该VPN的PE成员之间通过BGP或IGP自动发现机制将上述所记录的路径所经过的网络节点以及路径上被预留的链路资源信息在成员之间交互。  Further, in the resource reservation process through the signaling procedure, the signaling procedure may be recorded through the V-LSP network node and the result of the link resources reserved between these nodes, and the between members of a VPN PE by IGP or BGP auto-discovery mechanism recorded on said path and a path through the network node is reserved link resource information exchange among members. 当VPN成员之间的路径信息的交互完成后，VPN的所有PE成员节点都具有网络为该VPN所预留的链路资源的TE拓扑信息。 When the interaction pathways between the VPN membership information is completed, all the members of the PE nodes of the VPN network topology TE has reserved for the VPN link resource information. 当如图3所示的网络完成对VPN A和VPN B的资源预留、在网络中扩散相关的预留链路资源信息并且通过信令的记录路由功能完成和VPN成员之间的自动发现后，网络中的节点或路径计算服务器中会形成如表2所示的链路资源预留状态信息。  When the network shown in Figure 3. A complete VPN and VPN resources reserved B, the diffusion-related reservation in a network link resource information and by recording the signaling routing function and is completed between the VPN member after the auto discovery, a path node in the network server or link resources will be formed as shown in table 2 the reservation status information calculation. 上述为VPN所预留的资源可以被该VPN的客户连接请求所使用。  The reserved resources for the VPN, the VPN client can be used for connection requests. 当网络节点接收到一个VPN的连接请求时，从为该VPN预留的资源中为该连接请求分配合适的标签资源。 When the network node receives a connection request to the VPN, the VPN resources reserved for the connection request for the allocation of resources appropriate label. 比如，当图3所示的VPNA网络中的客户设备CElO需要建立到客户设备CE13 之间一条1*VC4带宽的连接时，通过信令过程，网络节点PE20、P30、PE23分别从上述为VPNA所预留的链路资源中选择合适的标签资源并建立交叉连接，完成CElO到CE13 之间的连接请求，并提供如图6中LSP 500所示的连接服务。  For example, as shown in FIG. 3 VPNA network in a client device needs to establish a CElO 1 * VC4 bandwidth between the client device when CE13 connected, through a signaling process, the network nodes PE20, P30, PE23, respectively, from the VPNA selected to link resources reserved suitable label resources and establish cross connections, the completion of the connection request between CElO CE13, and provide connection service 500 shown in FIG. 6 LSP. 当物理网络发生故障时，控制平面通过对受故障影响的V-LSP进行重新选路的恢复机制，在物理网络中选择其它的可用资源并重新进行资源预留。  When the physical network fails, the control plane by rerouting recovery mechanism for V-LSP affected by the failure, select other physical resources available in the network resource reservation and re. 当图3所示的物理网络中节点PE23和P30之间的光纤链路发生故障以后，P30和PE23节点会检测到链路故障，并确定该故障会影响到VPNA网络中的V-LSP1、V-LSP4、V_LSP6。 When the optical link between the physical network shown in FIG. 3 nodes PE23 and P30 in failure, PE23 and P30 node detects a link failure, the failure is determined and will affect V-LSP1 VPNA network, V -LSP4, V_LSP6. 网络中受故障影响的V-LSP路径上的节点会发起重路由恢复处理。 Node on the V-LSP paths in the network affected by the fault recovery processing initiate rerouting. 如图7所示，网络中和V-LSPl相关的节点PE20发起对V-LSP1的重路由恢复处理，并建立经过PE20、P30、PE22、PE23节点的新的预留路径V-LSP10 ；网络中和V-LSP4相关的节点PE21发起对V-LSP4的重路由恢复处理，并建立经过PE21、PE22、 PE23节点的新的预留路径V-LSP40 ；网络中和V_LSP6相关的节点PE22发起对V_LSP6 的重路由恢复处理，建立经过PE22、PE23节点的新的预留路径V-LSP60。  7, V-LSPl network and associated node PE20 initiating rerouting V-LSP1 recovery process, and after the establishment of PE20, P30, PE22, PE23 new reserved path node V-LSP10 ; and V-LSP4 network node associated PE21 initiating rerouting V-LSP4 recovery process, and after the establishment of PE21, PE22, PE23 new reserved path node V-LSP40; network nodes PE22 and related initiate V_LSP6 V_LSP6 for rerouting recovery process, after the establishment of PE22, PE23 new reserved path node V-LSP60. 通过上述对受物理网络故障影响的V-LSP的重路由恢复处理，从物理网络中重新选择新的可用资源并建立新的V-LSP以避开物理网络故障，从而实现了为VPN客户提供实时的可用的连通性服务。 Through the above V-LSP re-routing of the physical network affected by the failure of the recovery process, select the new resources available from the physical network and to re-establish a new V-LSP to avoid the physical network failure, enabling real-time to provide a VPN client connectivity service available. 上述本发明所述方法中的逻辑传送网络主要包括VPN网络尤其是LlVPN网络或VNT网络。  The main transport network of the logic of the present invention, the method comprises VPN network LlVPN particular network or network VNT. 以上所述，仅为本发明较佳的具体实施方式，但本发明的保护范围并不局限于此，任何熟悉本技术领域的技术人员在本发明揭露的技术范围内，可轻易想到的变化或替换，都应涵盖在本发明的保护范围之内。  The above are only the preferred specific embodiments of the invention, but the scope of the present invention is not limited thereto, any skilled in the art in the art within the scope of the invention disclosed can be easily thought variations or replacements shall fall within the protection scope of the present invention. 因此，本发明的保护范围应该以权利要求的保护范围为准。 Accordingly, the scope of the present invention should be defined by the scope of the claims. 1. 一种对网络资源进行预留的方法，其特征在于，包括步骤：A、传送网络收到资源预留请求后，获得该资源预留请求携带的逻辑传送网络的标识信息、所请求的链路带宽信息、源节点和目的节点信息；所述逻辑传送网络的成员节点为物理网络中的一组特定的网络边缘节点，所述网络边缘节点之间分配有一条或多条具有一定链路工程TE属性的链路资源；B、传送网络中的所述源节点确定到达所述目的节点的部分或全部显示路由信息；所述源节点给所述逻辑传送网络完成本节点相应的入端口和出端口链路的带宽资源预留，并标识预留资源的归属；将接收到的所述资源预留请求依次传递给显示路由中的包括所述目的节点在内的其它节点；所述其它节点给所述逻辑传送网络完成本节点相应的入端口和出端口链路的带宽资源预留，并标识预留资源的归属；在所 CLAIMS 1. A method for reserving network resources, characterized by, comprising the steps of: A, after transmitting the network resource reservation request is received, the identification information to obtain the logical transport network resource reservation request carrying the requested link bandwidth information, source node and destination node information; transmitting member nodes of the logical network for a particular set of network edge node in the physical network, the allocated among one or more network edge node has a certain link Engineering TE link resource attributes; B, the source node transmits the network determines the destination node reaching portion or all of the route information display; the source node to the logical completion of the corresponding transport network node and the port a port link bandwidth resource reservation and identifies the home reserved resources; the resource reservation request received sequentially transmitted to the display of other nodes, including the destination node comprises the route; said other nodes to the logical completion of the transfer port and the network port of a respective link bandwidth resource reservation according to the present node, and identifies the home resource reservation; in the 述源节点和目的节点之间建立虚拟的标签交换路径V-LSP。 Establishing a virtual V-LSP label switched path between said source node and destination node. 2.根据权利要求1所述的方法，其特征在于，所述的资源预留请求中携带：预留的链路带宽资源的共享属性信息和/或部分或全部显示路由信息和/或需要预留的链路资源的标识信息。 2. The method according to claim 1, wherein said resource reservation request carries: sharing attribute information of the reserved link bandwidth resources and / or displays part or all of the routing information and / or the need for pre- identification information remaining link resources. 3.根据权利要求1所述的方法，其特征在于，所述逻辑传送网络为虚拟专用网络VPN或1层虚拟专用网络L1VPN或虚拟网络拓扑VNT网络。 3. The method according to claim 1, wherein the logic for the transport network or a virtual private network VPN virtual private network layer L1VPN network or virtual network topology VNT. 4.根据权利要求1、2或3所述的方法，其特征在于，所述的方法还包括：根据所述资源预留请求中携带的链路带宽资源的共享属性信息，将所述V-LSP所预留的链路资源在不同的所述逻辑传送网络之间进行共享；和/或，根据所述资源预留请求中携带的链路带宽资源的共享属性信息，将所述V-LSP所预留的链路资源在所述逻辑传送网络内部不同V-LSP之间进行共享。 4. The method of claim 2 or claim 3, wherein said method further comprises: sharing the link bandwidth resources according to the resource reservation request carries the attribute information, the V- LSP link resources reserved in the logical transport between different network sharing; and / or, the attribute information of the shared link bandwidth resource reservation request in the resource carried in the V-LSP link resources reserved shared between different logical network transmission inside the V-LSP. 5.根据权利要求1、2或3所述的方法，其特征在于，所述的方法还包括：所述V-LSP的端节点确定所述V-LSP所经过的网络节点和预留的链路资源信息， 通过所述逻辑传送网络的自动发现机制，在所述逻辑传送网络的成员节点之间交互所述V-LSP经过的网络节点和预留的链路资源信息，所述逻辑传送网络的成员节点根据所述预留的链路资源信息更新所述逻辑传送网络的TE数据库；和/或，所述端节点确定V-LSP所经过的网络节点和预留的链路资源信息后，向网络中的路径计算服务器发布相关的信息，所述路径计算服务器根据该发布的信息来更新所述逻辑传送网络的TE数据库。 5. The method of claim 2 or claim 3, wherein said method further comprises: an end node of the V-LSP determining the V-LSP passes reservation network node and a chain channel resource information, the auto-discovery mechanism by logical transport network between member nodes of the transport network logical interaction V-LSP through the network node and link resource reservation information, the logical transport network and / or after, the end node determines that the network node and link resource information reserved V-LSP passes,; the member node updates the logical transport network resources of the TE link database according reserved computing a path in the network server publish information, the path calculation server to update the database logic TE transfer network according to the published information. 6.根据权利要求5所述的方法，其特征在于，所述V-LSP的端节点通过信令机制中的记录路由功能或者资源预留请求中指定的显示路由信息来确定所述V-LSP所经过的网络节点和预留的链路资源信息。 6. The method as claimed in claim 5, wherein said end node display V-LSP reservation request routing information specified by the recording function or resource signaling routing mechanism to determine the V-LSP through which the network node and link resource reservation information. 7.根据权利要求5所述的方法，其特征在于，所述逻辑传送网络的自动发现机制包括：基于边界网关协议BGP或基于内部网关协议IGP的发现机制。 7. The method as claimed in claim 5, wherein said auto-discovery mechanism logical transfer network comprising: a discovery mechanism based on Border Gateway Protocol BGP-based Interior Gateway Protocol IGP or the. 8.根据权利要求1所述的方法，其特征在于，所述的方法还包括：所述V-LSP所经过的网络节点通过路由扩散机制将本节点预留链路资源的信息在网络中进行发布。 8. The method according to claim 1, wherein said method further comprises: the V-LSP passes through the network node diffusion mechanism routing node reservation information link resources in a network release. 9.根据权利要求8所述的方法，其特征在于，具体包括：对于为一个逻辑传送网络专用预留的链路资源，网络节点发布的本节点预留链路资源的信息包括链路标识、剩余的带宽值；网络中的所有节点和/或网络中的路径计算服务器根据所述网络节点发布的本节点预留链路资源的信息来更新本地包含的全网TE数据库。 9. The method according to claim 8, characterized in that comprises: the information for node link resources, a network node is a logical dedicated transport network link reservation release reserved resources include link identification, the remaining bandwidth value; all nodes in the network and / or network path calculation server link resource reservation information according to the release node of the network node to update the local database contains the entire network of TE. 10.根据权利要求8所述的方法，其特征在于，具体包括：对于为一个逻辑传送网络专用预留的链路资源，网络节点发布的本节点预留链路资源的信息包括链路标识、剩余的带宽值、被预留的带宽值和归属的逻辑传送网络的标识信息；所述逻辑传送网络的成员节点根据所述网络节点发布的本节点预留链路资源的信息来更新所述逻辑传送网络的TE数据库，网络中的所有节点根据所述网络节点发布的本节点预留链路资源的信息来更新本地包含的全网TE数据库；和/或，网络中的路径计算服务器根据所述网络节点发布的本节点预留链路资源的信息来更新所述逻辑传送网络的TE数据库和更新本地包含的全网TE数据库。 10. The method according to claim 8, characterized in that comprises: the information for node link resources, a network node is a logical dedicated transport network link reservation release reserved resources include link identification, the remaining bandwidth value, the identification information conveying the reserved bandwidth of the network logical value belongs; member node of the transport network logical link resource reservation information according to the node of the network node to update the logical released TE database transport network, all nodes in the network reservation according to the present node of the network node link resources, information to update the local network-wide database contains TE; and / or paths in the network server according to the calculated the network node according to the node reservation information published link resources to update the logical transfer network and update the entire network database TE TE local database included. 11.根据权利要求8所述的方法，其特征在于，具体包括：对于为多个逻辑传送网络共享预留的链路资源，网络节点发布的本节点预留链路资源的信息包括：链路标识、剩余的带宽值、被预留的带宽值和预留资源的共享属性；网络中的所有节点和/或网络中的路径计算服务器根据所述网络节点发布的本节点预留链路资源的信息来更新本地包含的全网TE数据库。 11. The method according to claim 8, characterized in that comprises: a plurality of node information to the transport network shared logical link resource reservation, network nodes issued reservation link resources comprises: link identification, the remaining bandwidth value, the reserved bandwidth share attribute values ​​and reserved resources; all nodes and / or network path or network computing server resources reserved link node of the network node according to the published TE information to update the entire network database locally contained. 12.根据权利要求8所述的方法，其特征在于，具体包括：对于为多个逻辑传送网络共享预留的链路资源，网络节点发布的本节点预留链路资源的信息包括：链路标识、 剩余的带宽值、被预留的带宽值、预留资源的共享属性和归属的逻辑传送网络的标识信息；所述逻辑传送网络的标识对应的所述逻辑传送网络的成员节点根据所述网络节点发布的本节点预留链路资源的信息来更新所述逻辑传送网络的TE数据库，网络中的所有节点根据所述网络节点发布的本节点预留链路资源的信息来更新本地包含的全网TE数据库；和/或，网络中的路径计算服务器根据所述网络节点发布的本节点预留链路资源的信息来更新所述逻辑传送网络的TE数据库和更新本地包含的全网TE数据库。 12. The method according to claim 8, characterized in that comprises: a plurality of node information to the transport network shared logical link resource reservation, network nodes issued reservation link resources comprises: link identification, the remaining bandwidth value, the bandwidth value is reserved, the reservation sharing identification information and attribute ownership logical transport network resources; logical node of the transport network member corresponding to the identifier of the transmission network in accordance with the logic publishing node network node according to the reservation information updating TE link resource database of the logical transmission network, all the nodes in the network link resource reservation information of the network node according to the node updates the local release of contained TE entire network database; and / or paths in the network calculates the information server to reserve link resources in accordance with the present node of the network node updating the released logical transport network database TE TE whole network and update the local database included . 13.根据权利要求1所述的方法，其特征在于，所述的方法还包括：当所述逻辑传送网络收到客户业务请求后，从所述给该逻辑传送网络预留的链路资源中给所述客户业务分配标签资源，建立端到端的交叉连接，给所述客户业务提供连接服务。 When the client receives the logical network transmits a service request from the link to the logical resource reserved for the transport network: 13. The method of claim 1, wherein said method further comprises assign a label to the customer service resources, the establishment of end to end cross-connect, the customer service to provide connectivity services. 14.根据权利要求1所述的方法，其特征在于，所述的方法还包括：当所述传送网络发生故障时，检测到故障的节点确定受故障影响的链路资源和受故障影响的逻辑传送网络对应的V-LSP，通过控制平面发起所述V-LSP的保护或恢复信令过程，重新为所述受故障影响的逻辑传送网络预留可用的链路资源。 14. The method according to claim 1, wherein said method further comprises: when the network transport failure, a node failure is detected to determine link resource affected by the failure of the logic and affected by the failure transport network corresponding to V-LSP, the V-LSP initiate protection or restoration procedure by the control plane signaling, re-reserve link resources available to the logical transport network affected by the fault.